Prince Michael Andreas Barclay de Tolly was a Baltic German Field Marshal and Minister of War of the Russian Empire during Napoleon's invasion in 1812 and War of the Sixth Coalition. Barclay implemented a number of reforms during this time that improved supply system in the army, doubled the number of army troops, and implemented new combat training principles. He was also the Governor-General of Finland. The Battle of Saltanovka, also known as the Battle of Mogilev, was a battle during the early stages of the 1812 French invasion of Russia. The Battle of Schöngrabern, also known as the Battle of Hollabrunn, was an engagement in the Napoleonic Wars during the War of the Third Coalition, fought on 16 November 1805 near Hollabrunn in Lower Austria, four weeks after the Battle of Ulm and two weeks before the Battle of Austerlitz. 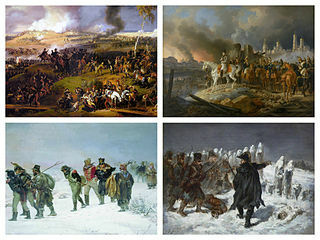 The French invasion of Russia, known in Russia as the Patriotic War of 1812 and in France as the Russian Campaign, began on 24 June 1812 when Napoleon's Grande Armée crossed the Neman River in an attempt to engage and defeat the Russian army. Napoleon hoped to compel Emperor of All Russia Alexander I to cease trading with British merchants through proxies in an effort to pressure the United Kingdom to sue for peace. The official political aim of the campaign was to liberate Poland from the threat of Russia. Napoleon named the campaign the Second Polish War to gain favor with the Poles and provide a political pretext for his actions. Jean-Marie Defrance (1771–1855) was a French General of the French Revolutionary Wars and the Napoleonic Wars. He was also a member of the Council of Five Hundred, and a teacher at the military school of Rebais, Champagne. The Battle of Vitebsk, sometimes spelled Witepsk, was a military engagement that took place on 26 and 27 July 1812 during the French invasion of Russia. The battle put a French force, under the command of Emperor Napoleon I, in combat with Russian rearguard forces under General Petr Konovnitsyn and Peter von der Pahlen and ended with the Russian forces making a strategic retreat from the battlefield.